Most jailbreakers do not seem to notice the fact that, not all Cydia tweaks out there are available directly from Cydia’s default repos. This is because, when Cydia is downloaded, it comes pre-installed with some default repos which are pretty popular and cover a wide range of tweaks and cydia apps. The two major repos on Cydia that almost dominate the jailbreak scene on iOS are BigBoss repo and ModMyi repo. Users of jailbreak who do not add new repos and try new tweaks are barely scratching the surface when it comes to customization. Trying out new things is the name of the game when it comes to jailbreaking your iOS device. However, we did prepare a list of 10 Best Cydia Tweaks iOS 8 Outside Default Cydia Repos that are a must have and are a part of some beta repos. These are new customization or utility related tweaks for iOS 8, which may not be available on your default repos. For those who do not know how to add new repos to Cydia, we have a solution for you as well, in this post. These are our picks for 10 Best Cydia Tweaks iOS 8 Outside Default Cydia Repos not present in default cydia repos. As the name suggests, MessageColor cydia tweak customizes the color of your messages inside the messaging apps. 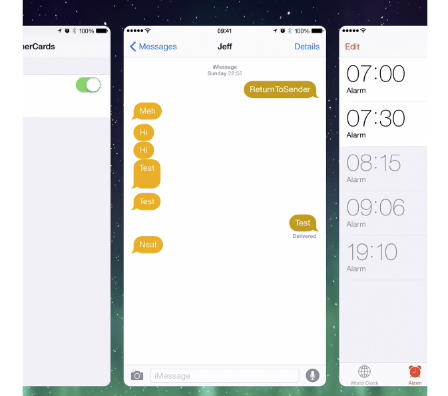 You can set different colors for the bubbles displaying SMS , received messages and iMessages as well. To install MessageColors, add this repo http://apt.steverolfe.com/ to your Cydia Sources. When you go to AppSwitcher by double tapping on home button, you get all the running apps in rectangular boxes. RoundedSwitcherCards cydia tweak makes these Cards round edged, replacing the default sharp edges given on iOS 8. To install RoundedSwitcherCards, add the repo http://cydia.ianburns.co/ to your cydia sources. Those who use iOS 8 must remember how their default lockscreen displays the digital clock time with a huge font. This is boring and sometimes useless. Alarmy Cydia tweak uses this exact place to display the next Upcoming Alarm that you have set. The time of this alarm is shown on your lockscreen with these huge characters of numbers which you cannot miss. 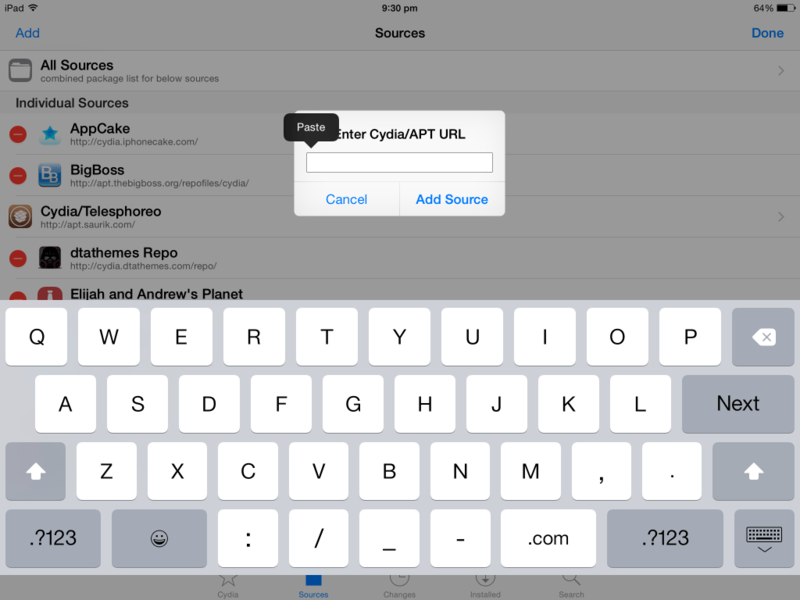 To install Alarmy Cydia Tweak, add this http://repo.fortysixandtwo.com/ repo to your Cydia sources. 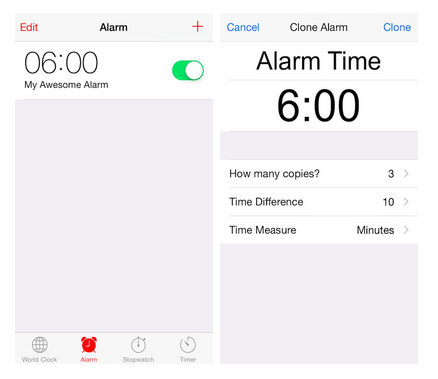 Using this alarm clock tweak, you can set the Volume for the alarm ring in the Settings app. You can enable or disable vibration too. This tweak is especially useful for multitaskers that do not want their alarm to be too loud all the time. To install vAlarm tweak, you must add this repo http://tateu.net/repo/ to your Sources in the Cydia app. Using this fancy little tweak for Control Center, you can limit the way control center opens with each scroll you perform from down below. Basically, what this tweak does is it presents the Control Center in Sections. i.e. when you open control center by dragging from the bottom of the screen, if you drag a little up, 1st section of the Control Center is displayed, drag some more -> the next section, a little more and the entire Control Center will show itself. To install this tweak, first add this repo http://rpetri.ch/repo/ to your sources in Cydia. For those of you who have used XBMC at home previously, Kodi is nothing but the renamed version of XBMC. In order to activate the full version of Kodi on your iOS 8 devices, you need to install this tweak called “Kodi”. For those of you who do not know what either XBMC or KODI is, it is a local media hub creating App, that latches on to all your media devices and streams HD videos, live TV channels and many more to all you devices. To install this tweak, you need to add this repo http://mirrors.kodi.tv/apt/ios/ to the sources in Cydia. This tweak gives an experience of true multi-tasking on iOS 8. All smart phones promise the users of their multi-tasking ability. 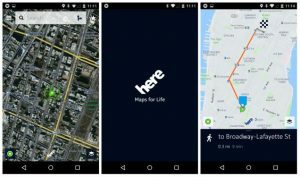 But there are few apps in that are really capable of running side-by-side. 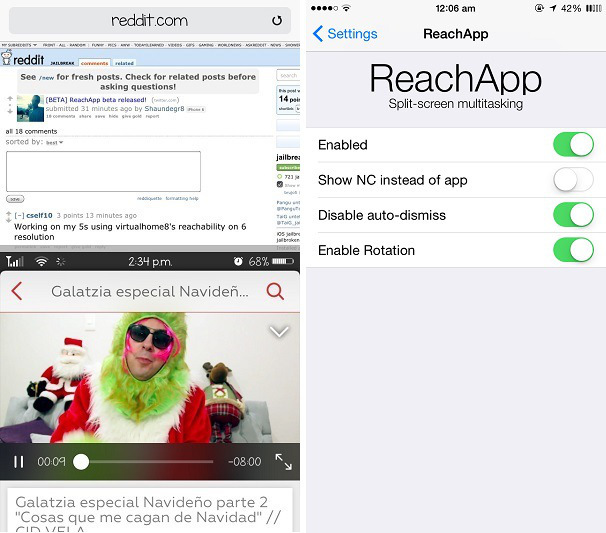 What ReachApp cydia tweak does is, it allows you to use two apps side-by-side and interact with them simultaneously; thus giving the user a real multi-tasking capability. To install this tweak, add this repo http://elijahandandrew.com/repo/ to the sources in your Cydia. This tweak performs a little change on your keyboard in the Messages app. 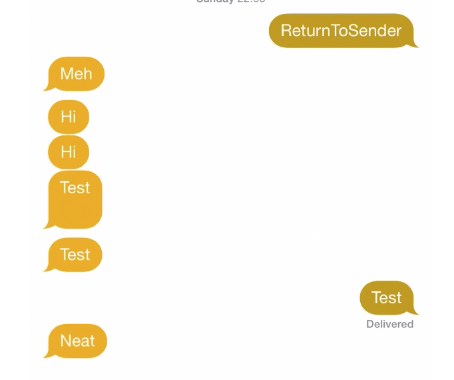 It gets rid of the “Return” button on the bottom line of the keyboard and replace it with a new “Send” button which will be very useful to send the message immediately. It also useful to send back quick reply. To install this tweak, you need to add this repo http://skyfrost.github.io/repo/ to Sources in Cydia. It adds a new badge that displays the current temperature to the stock Weather app you are using. Thus it localizes your weather app experience that much more for the better. To install this tweak, you need to add this repo http://repo.fortysixandtwo.com/ to the sources in your Cydia app. This messages tweak allows you to view conversation history or chat history right from the quick reply interface, which helps a lot especially for frequent users of the messages app. To install this little tweak, add this repo http://cydia.ianburns.co to the source in the Cydia app. So, these are our picks for 10 best Cydia tweaks not available in the default cydia repositories. How to Add New Repos to Cydia? Click Here to know how to Add new Repos to Cydia, in order to install new tweaks to your jailbroken devices. That’s it people. Hope you found these tweaks as useful and fun as we have on our jailbroken iOS 8 devices. For more latest tweaks and news, keep coming back.